2. 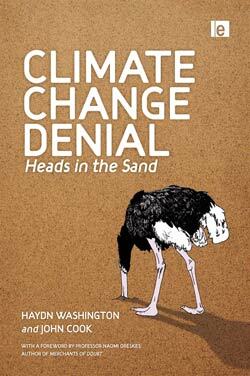 You still refer to us as “deniers” in much of your work. You admitted there was no such thing as a “climate denier” a few months ago (albeit after five years of using the term), but you have not adopted a more useful name, or apologized for abusing the English language. Clearly you think skeptics are run by their lizard brains, unable to think, prone to burying their heads in the sand. (Didn’t you put that on the cover of your book?) So in the end, if skeptics are deniers, and they are so incapable of thinking, it’s not rational for you to want deniers to “help” with this fallacy of a survey, because irrational dullards would be bound to do a bad job. It appears more likely that that what you are trying to achieve is a new way to survey people who disagree with your scientific opinion. That would make this a form of confirmation bias for the purpose of PR and not science. (See also point 1). If this is what John Cook thinks of skeptics, why would he ask them to “help” his research? 3. Your recent work with Stephan Lewandowsky has rather vaporized any small remnant of trust or goodwill most skeptics feel for you. Hence, as commenters are already saying on threads related to this, what skeptic would bother giving you 10 minutes of their time? One term I heard was “barge-pole”. I think that’s got it covered: It’s anti-science, illogical, run by the wrong man, and you haven’t been honest. But if you can fix all that, then send me an email.